Pardon, and many apologies. 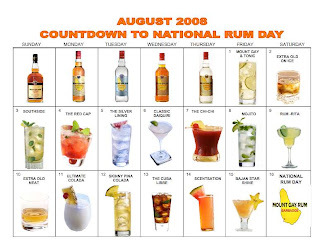 It seems we've got to catch up on the countdown to National Rum Day on Aug. 16. National Rum Day countdown courtesy of Mount Gay Rum. Click on the chart (right) to make it bigger and enjoy your drinks in color. Recipes follow. Shake all but the soda vigorously with ice. Strain into an ice-filled highball glass. Top with club soda, give a quick stir, and garnish with a sprig of mint. In a rocks glass, muddle 4 cherries with mint leaves and sugar. Add ice. In a cocktail shaker, mix Mount Gay® Rum Eclipse, a squeeze of lime, a dash of bitters and a slurp of grenadine. Shake well. Pour over ice and muddled mixture. Top off with ginger ale. Garnish with a sprig of mint and a cherry. Put all ingredients into a shaker with crushed ice. Shake sharply. Strain into a chilled glass with crushed ice. Garnish with a wedge of lime. Fill cocktail shaker with ice, add ingredients, and shake well. Pour into a chilled glass and garnish with a maraschino cherry and/or pineapple wedge. Muddle mint leaves and lime in tall glass. Cover with simple syrup and fill glass with ice; add Mount Gay® Rum and club soda; stir well. Garnish glass with lime wedge and sprigs of mint. Method:Rub the glass rim with a lime wedge and dip into rock salt. Pour all ingredients in ice filled shaker. Shake and strain over ice into rocks glass.. Garnish with a lime wedge. Pour lime juice into a highball glass over ice cubes. Add rum, fill with cola, stir, and serve. Garnish with a lime wedge. In mixing glass, muddle watermelon well. Add remaining ingredients and ice.Shake vigorously, then double strain (strain through Hawthorne into julepstrainer) into chilled cocktail glass. Garnish with wedge of watermelon oncocktail pick. *Lavender Syrup Boil 2 cups water and add 2 cups sugar and 1⁄4 cup dried lavender. Let Steepuntil cool. Drain and refrigerate. In mixing glass, muddle the quarters of Star fruit well. Add remaining ingredients and ice. Shake vigorously, then strain into chilled cocktail glass or coupe filled with cracked ice. Garnish with slice of Star Fruit.